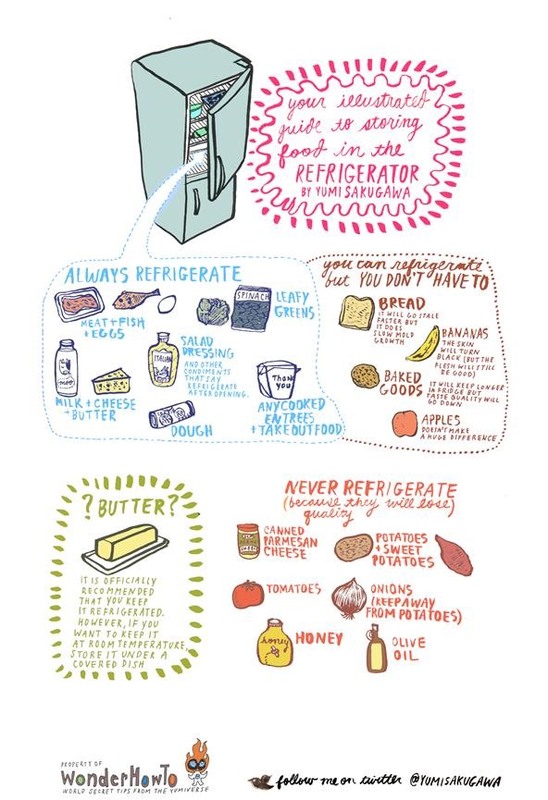 Enlighten yourself with this handy, printer-friendly, illustrated guide that you can stick onto your refrigerator door for future reference. If you know of any more fruits, vegetables, and other types of food that should and shouldn't be stored in the refrigerator, share your thoughts below in the comments. Shout out to Lifehacker for inspiring this drawing! good ones... I believe pickles, olives and jelly must be refrigerated once opened. I keep soy sauce and hot sauce out. Good question! Pickles, olives, jelly, hot sauces should be refrigerated after opening. As for soy sauce--it's okay to keep them at room temperature, but it keeps its flavor and freshness better if refrigerated. I've heard it both ways about ketchup.